1) seawater intake, ADCP measurements, 2) automatic weather station, 3) ICOS station (atmospheric CO2). 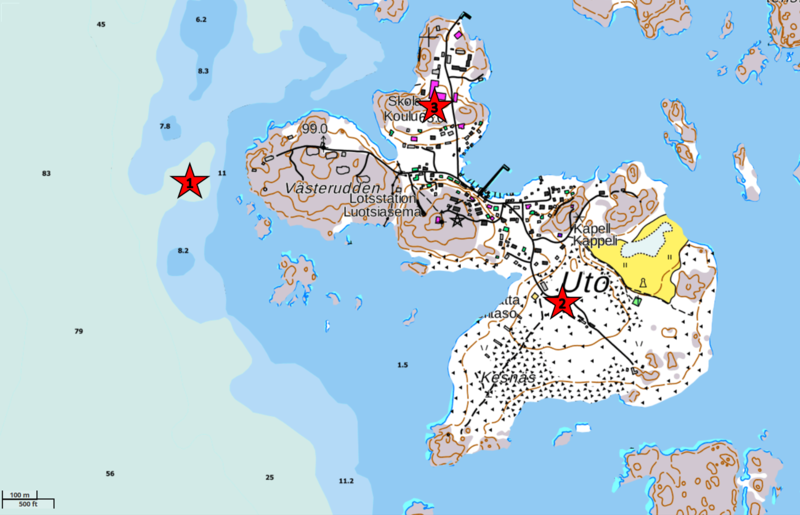 These pages contain real-time data measured at the Utö Atmospheric and Marine Research Station located on Utö island at the outer edge of the Finnish archipelago. The station is operated by the Finnish Meteorological Institute (FMI) and the Finnish Environment Institute (SYKE). The automatic weather station (AWS) data from Utö, as well as sea level data from the nearby tide gauge stations Hanko and Föglö, are freely available from the FMI open data interface. The data provided in these pages are automatically updated and have not been manually quality checked. Thus, the data may contain errors and inaccuracies. The timestamps of the data are given in Finnish local time. In winter this is EET = UTC+2h, in summer daylight saving time is used: EEST = UTC+3h. The daylight saving time is used from late March to late October, the exact dates for each year can be found e.g. here: https://www.timeanddate.com/time/zone/finland/helsinki. The creation of this web access portal has been funded by H2020-INFRAIA-2014-2015 project JERICO-NEXT.